Creates stunning fiery displays of colour. 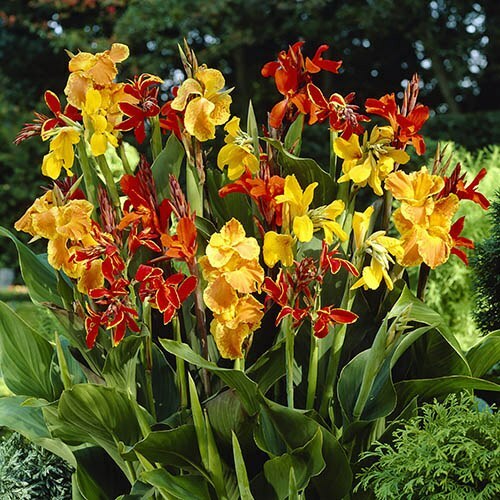 The yellow, orange and red, flowers will erupt in beds and borders adding height and impact.. Perfect for growing in large pots, at the back of borders, in sunny well drained spot. Over winter the the tubers in frost free area for use next year. Easier to grow than you may think, cannas are one of those exotic beauties that swiftly helps to create a bright, zingy summer garden. Their fiery hot colour combinations of yellow, orange and red will erupt throughout your beds and borders, adding great height and impact too. Each pack of 5 is a mix of colours, and also a mix of the green-leaves and lovely purple-leaved types, selected from taller flowering cultivars, so all will flower at 1m or more. Renowned for their tall flower spikes, grow them in large pots, or at the back of borders, in hot, sunny spots, in well-drained areas. Feed well when in growth - they will not start growing much until May, they grow away quickly as the summer warms. They will over-winter if they do not get too wet, and will benefit from a mulch - or the tubers can be dug up and stored in a cool, frost-free place over the winter for use again next year. Supplied as a pack of 5 rhizome tubers, to plant shallowly. They can be kept moist and encouraged to sprout by leaving out of soil in a sunny spot, and the new shoots will sprout - then plant where needed.